With the arrival of fall here in Cape Charles, Virginia, we notice a sudden appearance of pumpkin-flavored everything. From pumpkin spice lattes at Starbucks to Pepperidge Farm’s pumpkin cheesecake cookies, it seems like fall is all about this seasonal orange fruit. While I love the taste and the festive décor of pumpkins, I’m here to make a case for fall’s forgotten fruit—the apple! Fall is apple harvest time, after all, so let’s give a shout-out to this delicious and versatile fruit. Your apple-based recipe repertoire probably includes a good variety of pies, tartes, crumbles, and cakes, and now you’ll have one more recipe to add to the collection. Not only is our Bay Haven Inn Apple Delight absolutely delicious, but it’s beautiful to admire as well. With a bit of time and patience, you can master this dish that may make you never want to go back to pumpkin spice again! Preheat oven to 350 degrees and spray pan well with cooking spray. Let puff pastry sheet thaw partially. Cut apple in half, core and then slice vertically into thin slices. Place in a bowl and sprinkle lemon juice over apples, cover with a wet paper towel and microwave for 2-3 minutes. In a small bowl mix apricot preserves and water together. Place puffed pastry on cutting board with a piece of parchment on top. Cut the pastry into 6 equal parts, each portion will be approximately 3” x 8”. Smear preserve over the puffed pastry. Lay the apple slices lengthwise with the skin portion of apple to hanging off of the puffed pastry. Sprinkle apples slices lightly with sugar, cinnamon, and nutmeg. Fold the bottom half of pastry over the apple slices while still leaving about ¼ of the apple skin part exposed. 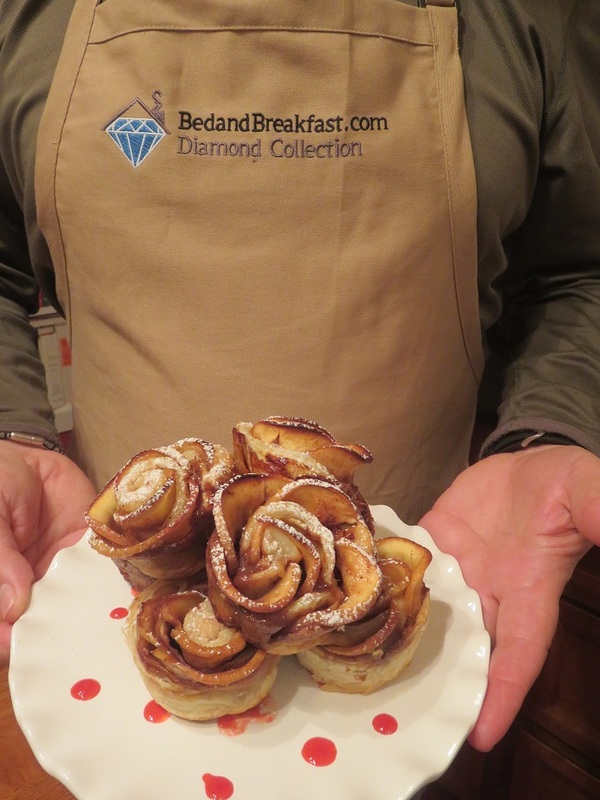 Take the short end of the puffed pastry and slowly roll it over itself creating a spiraled rose. Serve warm or let cool and store in a tightly sealed container. Eat, enjoy, and share a few photos with us on Facebook! This entry was posted in Bay Haven Inn Experience, Recipes and tagged Apple Blossom, Eastern Shore lodging, fall escape, Fall recipes by admin. Bookmark the permalink.